Anyone who got a bottle of this last time we offered it will not even READ this, no, they’ll be dropping 6 or 12 in their cart already and be on their merry way. They KNOW the deal. Seriously, 95 POINTS Wine Advocate (the last Rotie wine we did had 93 points), priced to amaze. Utterly face-meltingly ROCKING Washington Syrah priced like this does NOT happen often!!! If you like BIG, serious, powerful, savory, complex Syrahs that mimic something from the Northern Rhone, DROP what you’re doing and jump! Amazing price! As noted, this is not for the shy. Paying homage to the world-class producers in Cote Rotie, these wines are loaded for bear with plums, deep black raspberry, savory tapenade (olive) flavors, sweet soy, toasted peppercorns and spicy oak. Wildly flavorful and aromatic stuff that will drink for years if you can keep your hands off (we never can). Washington reds are more on fire than ever, and this is one of the finest deals we have come across (did we mention 95 POINTS?) ---- BUT...it’s pretty limited...we highly suggest grabbing a few at least - once you taste it you’ll wish you had bought more…! While it lasts..! Sourced from The Rocks District in Walla Walla Valley, the 2015 Northern Blend expresses the savory and earthy terroir of its region. It exhibits aromas of violet and bacon fat. On the palate, soft black fruits with velvety tannins and dark chocolate deliver a voluptuous and complex texture. 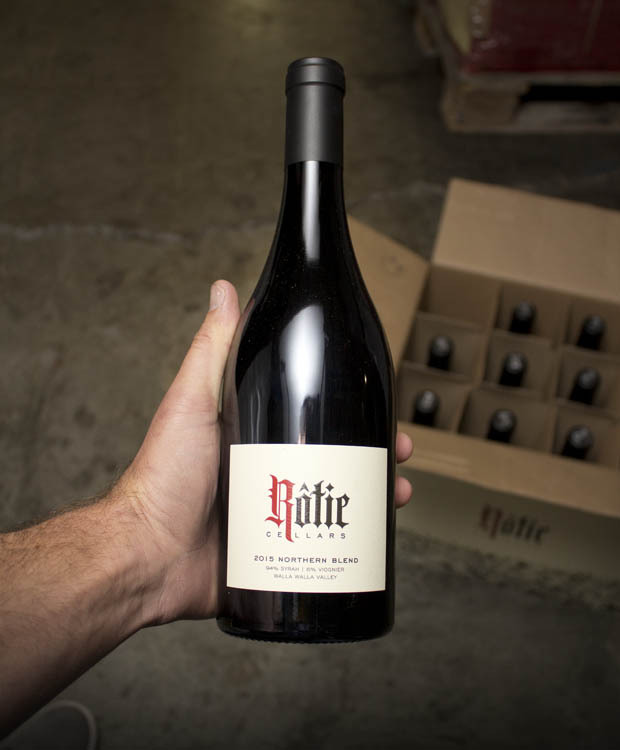 Rotie Cellars was born out of a desire to pay homage to the wines of the Rhône Valley. From the deep and complex Syrah-Viognier blends of the Northern Rhône, to the sultry GSM's of the South, the renowned region offers a wealth of inspiration. Since 2007, winemaker and owner Sean Boyd's goal has been to make traditional Rhône blends in Washington State. Boyd's winemaking philosophy is simple- combine old world winemaking techniques with the highest quality Rhône varietals that Washington has to offer. Boyd sources from some of the best and oldest vineyards in the state in an effort to showcase the most elegant blend possible, while ensuring the typicity of the fruit is expressed.